On Tuesday the 29th of November we went to the Tutankhamun and the Golden Age of Pharaohs exhibition at the Melbourne Museum. There were many artifacts which had been found inside his tomb ranging from golden statues to decorated chairs. The name King Tut has instant recognition in today’s world, however, prior to the discovery of his tomb in 1922 people were unfamiliar with this pharaoh. In fact, his name had been omitted from all of the lists of rulers the ancient Egyptians compiled. King Tut was born 1341 BC during the Amarna Age, a time when the pharaoh Akhenaten, his probable father, had introduced quasi-monotheistic beliefs into ancient Egypt, replacing the traditional religion. Akhenaten had moved both the administrative capital (Memphis) and religious capital (Thebes) to Akhetaten (modern Tel el Amarna) in Middle Egypt, a site not previously associated with any other god. It is here that this young prince, named Tutankhaten – to honor the Aten, the deity of his new religion – was born and spent his early childhood. The prince, however, ultimately did not maintain the religious movement his father introduced. He ascended the throne (around 1333 BCE), while still a child. Guided by two officials of the court, Tutankhamun restored the traditional gods and re-established Thebes as the religious capital and Memphis as the administrative centre. 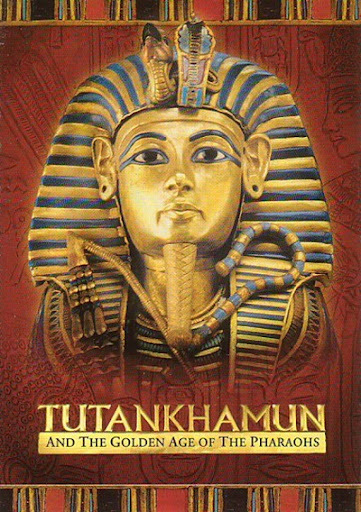 He also changed his name to Tutankhamun in order to direct attention to the restoration of the pantheon and the god Amun at its head. King Tut reigned for only about nine years, as he died in his late teens, but he has become famous the world over because his tomb was uncovered in almost perfect condition. You can read about the discovery of King Tut’s tomb here. via Tutankhamun and the Golden Age of the Pharaohs. 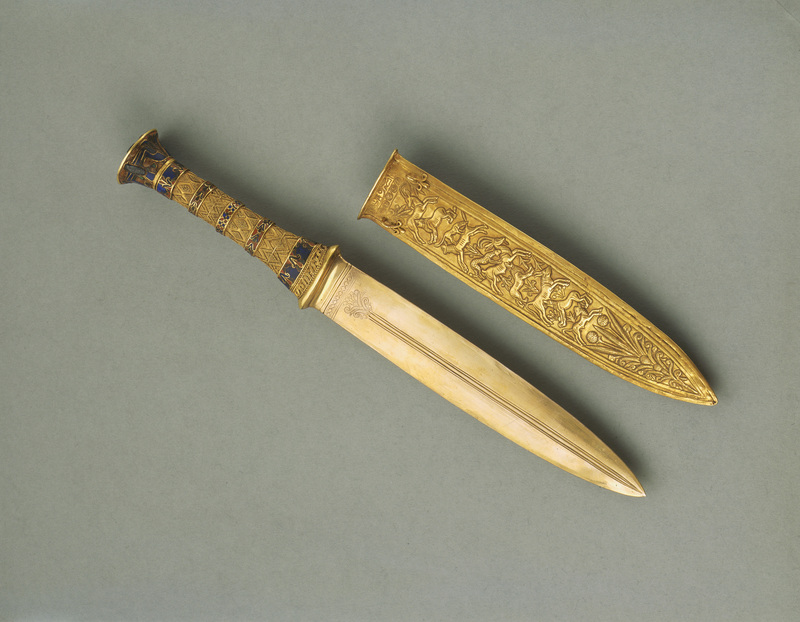 So important was this dagger to Tutankhamun that it was placed upon his mummy among the wrappings. The blade is highly polished gold with simple and elegantly engraved details. The hilt, also of gold, has alternating bands of granulated gold and cloisonn of red and blue glass. The pommel surmounting the handle has a circlet of two falcons with outstretched wings, while its top is decorated with a floral motif, in the center of which are two cartouches with the names of the king.